Children, as part of their normal development, intensely experience a wide range of emotions. Both parents and children may struggle, at times, with how to understand the meaning and value of such experiences. This is true not only about the intensity with which some emotions are felt but in particular about some emotions which are associated unfortunately with negative meanings, such as fear and rage. Creatures attempts to provide one, of many possible ways, to accept and understand the value of all emotions. Each emotion is given a time and place where its intensity can be experienced, understood, valued and appreciated for the personal meaning and truth the emotion contains and reveals. Creatures uses images, form, rhyme and color to present children with both the familiar and new; all in a boundless arena which, to the child, is always larger than life. Parents reading with their children can provide one of the most valuable and memorable experiences in a child's life. 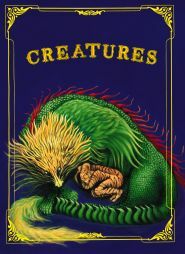 In Creatures, the added dimension of human emotions are brought to life throughout the book's thirteen full color chapters with characters such as Creatures Happy, Sad, Smart and Fear. Creatures is an enjoyable way for families to develop ways of identifying and understanding familiar, and sometimes difficult, emotions in an atmosphere of acceptance and tolerance, as well as encouraging thinking, discussion and communication. The book's playful rhymes and colorful artwork invite beginning readers to listen and participate, while its varied vocabulary, captivating images and depth of meaning will challenge older, more accomplished readers and ensure a place in your home library for years to come. The text pages reproduced below are in black and white to make your browsing quicker. The original pages are printed in four-color process. Commercials, interviews, and online readings of CREATURES are also available. 9 x 12 128 100# Sewn 120 point laminated 15 full-color original oils, 10 color-wash pen and ink drawings. Hand drawn detailed borders on every page. I am honestly at a loss as to how to categorize the next book. With the rich colors and exotic yet familiar creatures, it could easily be an art book second to none. However, its lyrical poetry could move it into the literary book category without missing a beat. But it’s the stated purposes of the book, 1. to invite, encourage, and challenge children to read, and 2. to encourage and help children explore and discover feelings in an accepting, tolerant atmosphere, that make this a children’s book. Creatures uses poetry to describe emotions and feelings such as happiness, sadness, anger, greed, and love. The rhyming quality makes this a good read-aloud book for pre-readers, the colorful artwork will intrigue all ages, and the vocabulary will interest beginning readers and challenge more advanced readers...this is a beautiful book, excellent for sharing with your favorite child. Through the rhymes and expressive characters in Creatures, children have found it easier to explore and verbalize their feelings. Creatures is wonderfully illustrated. I've found the chapters most enjoyable. I think children will have fun reading the book and discovering the message behind each chapter. ...a clever, humorous book that adults and youth will find stimulating and engaging...playful rhyme scheme and colorful artwork... a process for adults and youth to discuss feelings and emotions... I have given the book to friends and colleagues with children and those working in art and education. They have really enjoyed it. 'Creatures' is a multilayered, richly illustrated exploration of the labyrinth of human emotions presented in a format young children can enjoy and adults can savor. CREATURES Reading: The atmosphere was eagerly received. Children and adults enjoyed learning. Our goal is to encourage families in reading together daily. We hope you'll return. The book is wonderful. The children love it. It is a wonderful therapy tool. I'm spreading the word. Creatures is a book that reaches out to families, giving them a tool to investigate their feelings through unique characters. CREATURES Drawing Workshop: Thank you for your wonderful program last Friday "Creatures." If only children would feel comfortable at home and school discussing their feelings. CREATURES Drawing Workshop: Please know your visit was greatly appreciated. I hope you'll come back next year. The children really enjoyed it.